February 10th, 2011 - Hello everyone and currently I am in Bali and will be updating the tour soon with new information. While much of the information provided here is still very relevant, some of the details will soon be changing and if you are interested in traveling to Bali, please email our office here: info@aguafina.com, and we can contact you with the latest plans. Thanks for your interest! In Bali, unlike any other place I have visited, the modern art form of gardening combines with a rich traditional culture to create a truly unique blend. The result is a cutting edge style of its own. The fusion of traditional craftsmanship with modern influences set against a lush landscape produces the most extraordinary examples of garden design, artistry and architecture. The use of outdoor living spaces and fluid transitions from interior space to exterior is only one example of this small island's impact on the international design community. 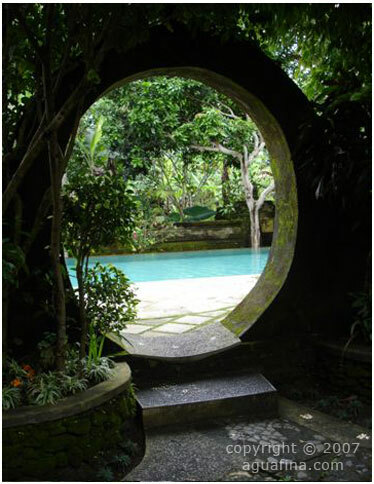 Bali truly is a place were East meets West with exceptional results. With the added benefit of being situated in a tropical climate, the gardens of Bali seem to come more alive than one would ever think is possible. I hope that you will be able to join us for this unique opportunity to explore the culture, art, gardens, architecture, and natural wonders of Bali.